Interestingly, this has less armor than the Jerkin of the Untamed Spirit (http://www.wowhead.com/?item=28051), but more armor and stamina. Seeing as they increased the armor percentage increased by bear form, it looks like they're encouraging bear druids to stack more stamina and defense rather than just looking at pure armor, a concept that has been foreign to most bear tanks before the expansion. for pre-heroic dungeons armor is by far the most desirable stat for a tanking druid, followed by agility. now once you start getting into the endgame you gotta worry about crushing blows and crits, so defense is nice for preventing burst damage and making life hard for your healer. this would also be a nice piece when you are taking lots of magic damage due to the high stamina. 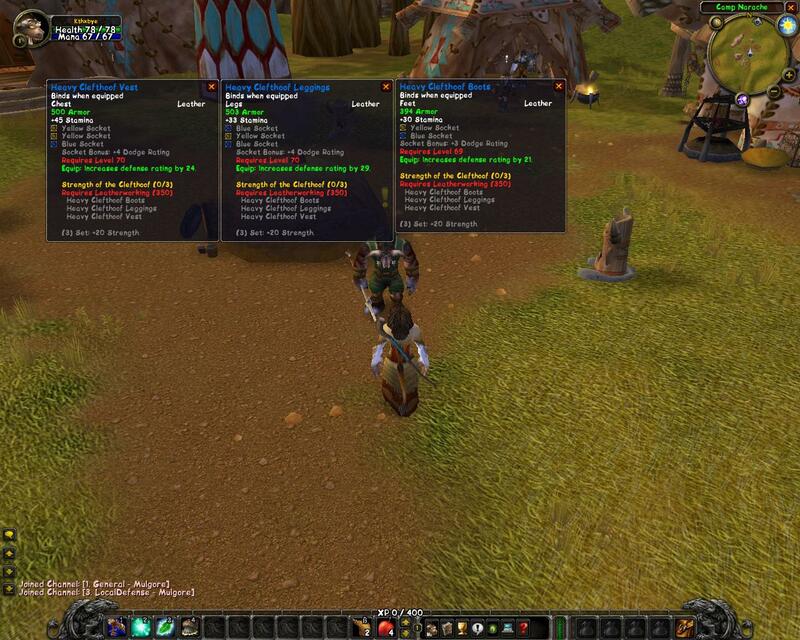 Armor is defintatly the most important stat for a pre raiding druid, but stamina comes in second. This is one of the best peices of Bear tanking gear because it can be socketed, allowing people to either add agility or defense. Warning: If you are not a leatherworker you will not get the +20 str bonus from the set. What gems would you guys suggest to add to this 3 piece set? My stamina and armor went up, but my agility droped pretty bad once I put these on. Which gems are bears putting in their clefthoof vest? Blue: Stamina, Yellow: Enduring? And how far away is the next chest slot upgrade for bears? Which enchant to put on it ? BUT the Heavy Knothide Armor Kit http://www.wowhead.com/?item=34330 gives you 10 more stamina in bear form and costs a lot less. Can someone explain and do the maths? The extra armor is gone again, as of 3.02. I don't see the +defense doing much good for a druid tank now (they'll have talents for that). Is there really much point in the Heavy Clefthoof set now? Extremely disappointed in the armor loss of the Heavy Clefthoof equipment. It's a lot of time and money invested into something that is now just about useless for tanking. Losing the armor bonus from this set along with Boots of Natural Grace resulted in the loss of many thousands of points of armor, very irritating. A question I have is why did PvP gear not take the same hit? To me it's just another push in the direction of PvP oriented gaming philosophy. Omenai Vest and Jessera's Fungus Lined Vest use the same texture with a different color scheme. Both are quest rewards for alliance only. I have no idea why this is so expensive? Practically useless, if you want timewalking gear just go clear Sunwell/Black temple for the sockets..